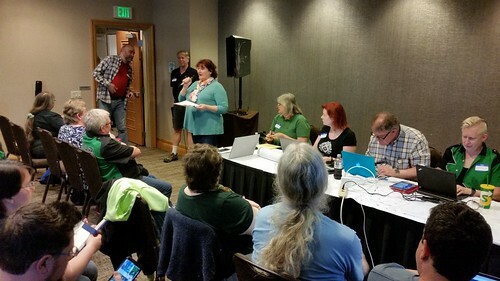 "StaffCon" for Worldcon 76 planning had over 100 people registered, using the same RegOnline system that the convention itself is using. Today was a chance to do a bit of a dry run of what on-site registration would be like, and to discover some bugs now while there is a chance to adjust them and make things better for the actual convention. After the initial morning session, there were numerous impromptu meetings (including a short WSFS division meeting with the four members of the division who are actually here), followed by groups touring the San Jose Convention Center. There's an event moving in today, so we couldn't get at everything, but everyone got a decently good look around before the lunch break. The break allowed people to spread out and find places to get lunch within a short distance of the convention center. There are many such places (far more than there were sixteen years ago). A fairly large chunk of the afternoon session was taken up with going through the Move-in/Move-out process, going division-by-division through the various things that each group expect to have to move into and out of the convention center, and how we expect it to happen, particularly working within the constraints of the San Jose McEnery Convention Center. As we went through the divisions in alphabetical order, I went last. As I came up, I said, "Hey, there's only three areas in the division? How hard can it be?" which was met with loud groans. (This is actually a good thing, because it means that most of the people there knew that nothing as simple as it appears.) But seriously, WSFS's move in/out is nowhere near as impactful as, say, Curated Exhibits or the like. The walkthrough of major logistical requirements of the divisions was very good, because it pointed out a number of gaps in planning, not excepting the WSFS division. Much better that we spot them now in May than in mid-August! There were other planning sessions that I won't go into here because they covered some things that are not necessarily mature, but I would say it was a very useful and productive day, after which folks once again fanned out to find food. Downtown San Jose is hopping and loud with Cinco de Mayo revelers, but the group I was with managed to find a decent Japanese restaurant. I've had a good time with this heavy-duty smoffing. I'm increasingly confident that we're going to have a really good Worldcon and will overcome the challenges that any Worldcon faces. 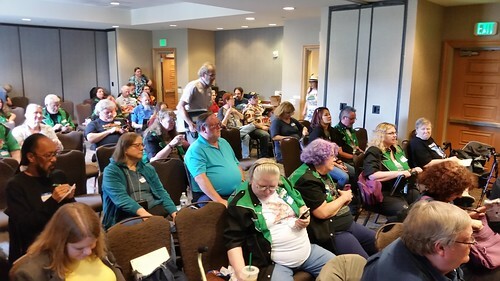 Kevin Roche has assembled a good, motivated team of both seasoned Worldcon runners and more local convention-running fans who can be trusted to do the right things.